How to use the most powerful weapon that I’ll talk about (hint: it’s not physical) to achieve the lean, strong, energetic and healthy body that you’ve always wanted. How your body repairs and recovers itself using a particular type of food (hint: this food is known to be the building blocks of our body). How certain types of foods prevent your body from burning “stubborn fat”. How to take advantage of nature’s free medicine cabinet to improve your health at a rocket speed. What types of dietary fats to incorporate into your diet if you want to lose your body fat. How a “magic bullet” that I’ll reveal can literally transform your body and life. What type of goals to set if you are serious about achieving the lean and healthy body that you want. Why most people fail to keep off the weight (i.e. 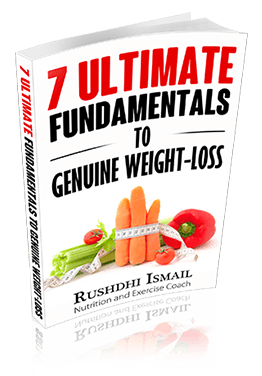 sustainable weight loss) and how you can overcome this major hurdle. 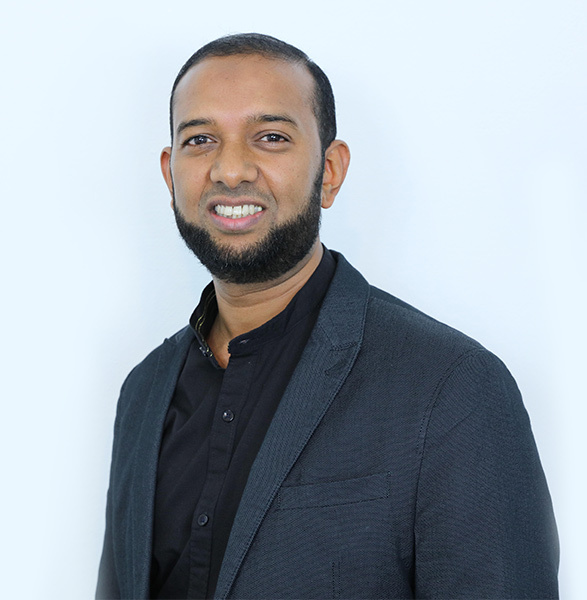 I’m Rushdhi Ismail, CEO and Founder of Lean & Healthy. I’m a certified nutrition and exercise coach. For the last three years, I’ve been helping Muslim men and women in more than 30 countries from 5 different continents to regain their health, to increase their energy and to get into the best shape of their lives! For close to 2 decades, I myself had been struggling with losing weight and keeping it off. And during that time, I have probably tried more weight-loss programmes and “shortcut strategies” than I can possibly count. I did have some success with certain diet programmes and methods that were really shortcuts, but these successes were short-lived. I gained all my weight back (and even more whenever I stopped dieting). It was all so frustrating; in fact, I was close to giving up on the idea of losing weight. I thought I’d never live to see my lean and healthy body. Alhamdulillah, when I thought there was no light at the end of the tunnel, Allah subuhanawuta’ala showed me a way, and He helped me to crack the code of nutrition and exercise with the help of some world-class nutritional scientists. My commitment to excel in my nutrition and exercise certification, as well as my never-ending passion to experiment with health hacks finally paid well to achieve the best health and shape of my life, Alhamdulillah! I’ve now systemised and condensed all my 20 years of struggle, learning and experience in a 6-months Online Coaching Programme. For the last three years, I’ve been transforming countless lives around the world through this Islamically oriented, rigorously researched, practical and innovative Online Coaching Programme that helps Muslims to improve their health, increase their energy and to achieve the best shape of their lives. I’ve made my life mission to help the Muslim Ummah get leaner, stronger and healthier, bi’idnillah! Within the next three years, I want to reach at least 1 million Muslims through my writings, free and as well as my paid courses. I don’t need to lose weight, but I look for ways to live a healthy life. Is this free course right for me? Sure, in this course you’ll learn the basics of healthy nutrition and exercise. So, regardless of your health and fitness goal, you’ll insha Allah immensely benefit from it. Will I receive login details to access this course? No, you’ll receive the content of this course by email. After signing up for this course, check your inbox for the course content, which includes an email with material for each day for the next seven days. I’ve subscribed to this course but didn’t receive any emails. What should I do? Is my email address in safe hands? Absolutely! We take your privacy and safety very seriously. We have 100% no spam policy. And our website is a fully secured site that protects all content including your details. Well, I must say your way is awesome, I mean wow, literally wow. I am LOVING this newsletter series of tips - they are intelligent, very concise and no-nonsense! Plus I love the holistic angle and the sensible advice. Keep up the amazing work! Thank you. Really your way of how the individual makes his or her quality of life of excellence is great from people like you . Jazakum Allah Khair. Thanks be to Allah for being part of this healthy revolution that is transforming lifes. SubhanAllah excellent articles on becoming lean , I'm enjoying it every day Alhamdulillah n following it too , jazakallahu khairun kateeran kateera brother for ur efforts n may Allah provide you more such opportunities to serve the ummah . AAMEEN. This was really helpful. Jazakallah Khair. Please keep up the good work.